"Most importantly, never take along anything on your journey so valuable or dear, that its loss would devastate you." Anyone who has ever been on a vacation or a business trip knows that there will always be unavoidable surprises. While sometimes frustrating, it is often these spontaneous occurrences that prove to be the most memorable and enjoyable portion of the trip. Our journey through life is similar to that of a tourist traveling through a foreign land for the very first time. The uncontrollable chaos of it all can be overwhelming, and, as a result, many of us often fear and reject change. However, it is through these frightening changes that we tend to experience our most significant growth as human beings. This is the theme of The Accidental Tourist, a film filled with such natural human realism that it nearly feels like watching a documentary. The film centers on novelist Macon Leary (William Hurt), who has found moderate success from his "Accidental Tourist" books. These guides are designed to help the reluctant traveler better cope with the unknown hardships of traveling. Primarily, Leary gives stability and security to those who would rather be confined to the familiar comforts of their living room couches. He offers advice on how to avoid contact with strangers, where to find American fast food restaurants in foreign countries, or anything that might help the tourist avoid the uncertainties that go hand in hand with traveling. Unfortunately, he is also helping them to withdraw from society. Macon tries to live his life in a similar fashion, but he has not yet realized that there is no guidebook for the road of life. Even though he has tried to keep his life meticulously under control, he has been blindsided by one of life's cruelest surprises. One year after the tragic death of his son, he has all but retreated from the world. He barely registers any emotion when his wife, Sarah (Kathleen Turner), tells him she needs a divorce. In an effective flashback sequence, Macon identifies the body of his recently murdered son, and, as the camera slowly zooms in, we can see the anguish swelling on his face. Yet, he suddenly chokes it back because it is easier for him to suppress his emotions than to acknowledge them and therefore come to terms with his grief and pain. After the departure of his wife, Macon finds that his dog will require kennel care while he is away on one of his business trips. It is at this kennel where he meets Muriel Pritchett (Geena Davis), who is essentially the exact opposite of Macon. She is free-spirited, cheerful, outspoken, and sociable. She finds an immediate attraction to Macon, not only as the result of physical desire, but also because her intuition recognizes that he is a soul in pain. Macon continually declines her advances, but Muriel shows great persistence in tempting Macon to come out of his shell and rediscover himself. The Accidental Tourist kept me captivated from beginning to end. I found myself so immersed in this story that I lost all touch with external interference. Every nuance of the film feels essential, with each word, subtle glance, and camera angle serving the greater purpose of the story. Adapted from Anne Tyler's novel, the Oscar�-nominated screenplay by Lawrence Kasdan and Frank Galati is abundant with enriching dialogue. The characters exude a subtle sense of realism rather than the overacting often seen in fictional dramas. Even the character of the dog has been brilliantly constructed. The actors relish in this material, each performer offering a unique contribution to their characters. There are no action sequences or fantastical events in The Accidental Tourist, but it entertains better than most such fictional works. Many people watch motion pictures much like an accidental tourist would tour a foreign country, shutting off their emotions and relying on the filmmakers to determine their level of fulfillment. The Accidental Tourist asks for the involvement of the audience. It empathetically channels our emotions by presenting sometimes uncomfortable, but no less realistic, situations that we all can relate to. Those who watch movies purely for escapism will most likely find it a bore. Those who appreciate the way in which art imitates life will discover a rare gem of a film. Image Transfer Review: While adequate for the age of the film, this 2.35:1 anamorphic widescreen image transfer lacks much of the qualities that I have come to expect from more recent transfers, including those of other 1980s films. The image is greatly lacking in fine detail, lending a soft and somewhat bland characteristic to the picture. Colors are muted throughout, which seems primarily due to the bleak cinematography, yet also due to the age of the source material. Compression artifacts are frequently evident, though not overtly distracting. Contrast appears a bit unbalanced in darker scenes, causing shadow detail to suffer slightly. Overall, this is a clean presentation of a 16-year-old film, and any deficiencies are minimal enough so as not to detract from the enjoyment of the movie. Audio Transfer Review: The original Dolby Surround 2.0 track is a satisfactory complement to this dialogue-driven film. John Williams' score sounds excellent, flowing expansively into the surround channels. The front soundstage is wide and distinct with effective utilization of stereo effects. Most importantly, dialogue is clear and intelligible, though conveys a bit of a harsh and dated characteristic at times. I have no major complaints about this fitting soundtrack. Extras Review: We begin this small collection of extras with an Introduction by Lawrence Kasdan, where the filmmaker reflects on The Accidental Tourist and its themes. He mentions the allure of the novel, which he thought had such a wonderful combination of drama and humor. While it is nice to hear Kasdan's thoughts on the film, this three-minute featurette is too short to provide anything of value. Next, is a scene-specific commentary by Geena Davis, running approximately 38 minutes. Here, the Oscar�-winning actress offers comments for pivotal scenes involving her character. While I would have liked to have also heard a feature-length commentary with Lawrence Kasdan, Davis provides quite an interesting analysis of her character. She truly gets to the heart of what it took to create Muriel, discussing everything from the importance of her costume design to the methods in which she interacted with the other characters. It's Like Life is a typical featurette, featuring interview footage with Lawrence Kasdan, Kathleen Turner, and Geena Davis, as well as clips from the movie. While this 12-minute piece is fairly conventional, it does offer revealing insight into the complexity of the screenplay, which may enlighten viewers who did not pay close enough attention during the film. The most impressive extra is the section of deleted scenes, titled Lifted Scenes. A total of 18 scenes, clocking in at approximately 38 minutes, are presented with acceptable nonanamorphic widescreen transfers. Each scene is preceded by a brief description of what we are about to see. This is a great collection of footage, and while all of the scenes were wise exclusions from the final film, it is certainly worthwhile to now see these interesting subplots thanks to the magic of DVD. Rounding out the special features is the theatrical trailer, presented in anamorphic 1.85:1 widescreen. Even with the 1.85:1 framing I could detect severe cropping of the 2.35:1 image. This is an excellent trailer that effectively conveys the subject matter of the film without disclosing too much information. 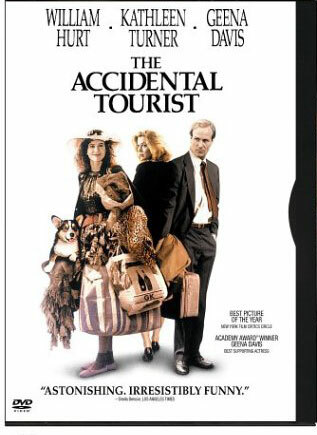 I had not seen The Accidental Tourist until the release of this DVD, and I now fully comprehend why it is so highly esteemed. A wonderful blend of both humor and drama, this classic film belongs in every cinema buff's DVD library.